Murillo, a native of Seville, was a generation younger than Zurbarán and Velazquez. Immensely popular throughout Spain and Europe, he was often called the "Spanish Raphael" for his sweet, idealized Madonnas and the softness and delicacy of his modelling. The characters in this painting are portrayed naturalistically yet retain the ideal, innate grace and elegance that are consistent with Murillo's figures from the late 1640s on. His modeling is solid yet handled with a painterly touch. Although this work displays a strong chiaroscuro, the general effect is one of luminosity: the darks are not so opaque, the lights are strong and the colors are saturated. If it weren’t for the angels tumbling from the sky, we might not realize at first that this charming scene of a newborn’s first bath is a religious painting. It’s by the 17th-century Spanish artist Murillo, whose naturalistic and engagingly human depictions of Biblical events made him one of the most popular artists of his day. The holy child being so tenderly cared for by these smiling Spanish ladies is John the Baptist. Murillo takes an obvious delight in showing us the paraphernalia of babyhood lying next to the basket of swaddling clothes. The kneeling attendant on the left prepares to take away the basin and pitcher of water, while an older woman carefully pats the baby dry. 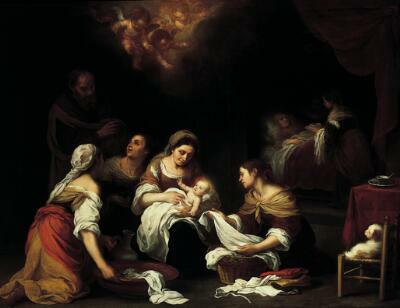 The cleansing of a newborn was surely a joyous and familiar ritual in Murillo’s day. But here, it may also allude to John’s future role as the man who baptized Christ. Like Christ’s, John’s birth was considered a miracle—his mother was aged and barren. We glimpse her, in the background, exhausted and resting after the birth. The man on the left is John’s father, Zechariah, who gestures toward his newborn son. Notice how Zechariah’s head initiates a chain of linked glances and gestures… They gracefully lead us down to the lower right corner—and one of the painting’s most charming touches—a soft puppy on a child’s chair. Depictions of the infancy of Christ and his cousin were popular in seventeenth-century Spain. Given the large format of this painting, it was probably commissioned for a church or monastery.